NextGen Gaming is the latest developer to take a trip to the land of the ancients in the form of Cleo’s Wish. It’s a 5 reel, 25 payline game that comes with bold, colourful design and plenty of features. They include stacked wilds, symbol matches and 2 free spins rounds. Stakes start at 30p, rising to £60 per spin. There’s a cartoonish feel to the design in Cleo’s Wish. With sand, pyramids and the River Nile in the background, the reels include lower value A to 9 values as well as a gold bracelet, an ankh cross and a scarab beetle. The most rewarding standard symbol is the logo which will get you 400 coins if you land 5 on a payline. The smiling face of Cleo is the wild – she can land anywhere on the reels and substitute for all other symbols apart from the pyramid bonus symbol. Cleo can also net you payouts of up to 500 coins per line. The base game action comes with a few little randomly hitting extras. If the Wish Upon a Wild feature becomes live, the designated reel or reels are guaranteed to feature a wild. The Sands of Fortune feature transforms the higher value bracelet, ankh, beetle and logo symbols into the same symbol. Cleo’s Parade feature – on free spin 1, reel 5 will feature a stacked wild. On each of the following free spins, the stacked wild will move 1 reel to the left. Normal wilds can land elsewhere and more re-triggers are on offer too which will start the stacked wild on reel 5 again. Once the stack of wilds appears on reel 1, the feature ends. Eternal Riches Free Games feature – 5 or 10 free spins are awarded here. If a wild lands, the Super Spins Multipliers increases by 3. Land a scatter and it’s the Super Spins Meter that increases by 3. After all the standard free spins are done, you’ll play the Super Spins feature with your collected super spins complete with multipliers. 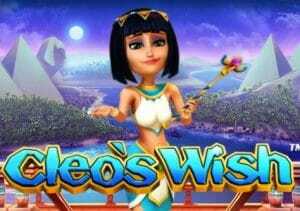 Cleo’s Wish is a different take on the classic Egyptian-themed video slot – it has a light-hearted, comedy feel. The design isn’t bad and there’s a decent selection of extras on offer. If you’re a lover of the ancient theme, this modern version is worth a look. I also recommend you try some classics with Novomatic’s Pharaoh’s Ring and IGT’s Sphinx Wild recommended.